Back today with a quick share for Paper Smooches. 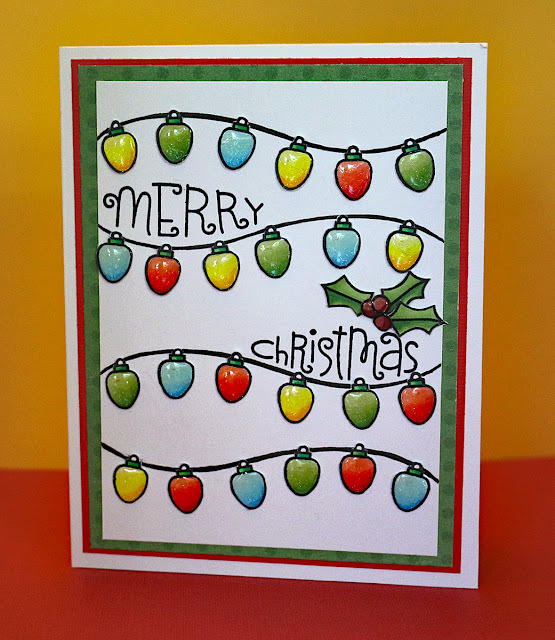 I am having a blast guest designing for them this month including this fun Christmas card I created using their Wavy Wishes stamp set. I actually also used the Wavy Pattern dies set as a template to draw the fun wavy design my lights hang off of. I was inspired by the shape and thought it made a good platform to hang the lights on. The lights are stamped and then colored with my Copics. I also used a fine glitter pen to add some shimmer on them. I am not exactly sure why, but I fussy cut them and then glued them all done on the card --- then realized I should have just stamped them directly on the card. Silly woman! I added some crystal lacquer to each one to make them shine. I used the same stamp set to add the holly leafs and the stamped sentiment. Then a few patterned paper layers complete the card. Hope you enjoyed my share today. Don't forget to head over the Paper Smooches site to check out all the August release... and rumor has it there is a big blog hop coming up as well. Lots of inspiration headed your way. This is quite pretty and oh so festive. An awful lot of intricate cutting there but it's made a super creation and clever adding the glitter as they really do appear as though they were lit up, many thanks for joining us at Stamping Sensations challenge.